▼ Collect [Limited] 2.5m Commemoration Bread from the Daily quest [2.5m User Commemoration Banquet]! 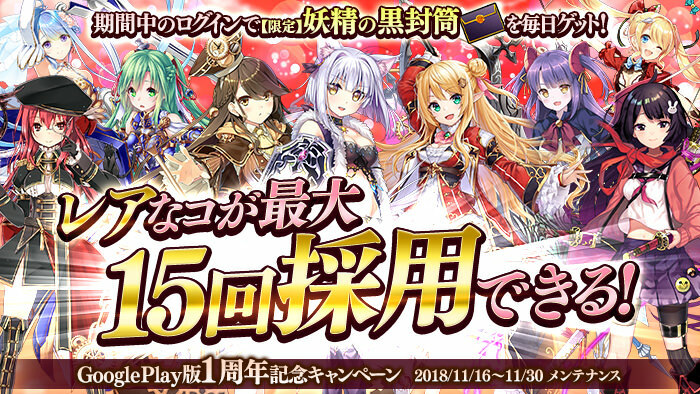 The [2.5m User Commemoration Banquet] quest is a daily quest that can be sortied to once per day. The [2.5m User Commemoration Banquet] quest gives 2.5m EXP and always drops 1x [Limited] 2.5m Commemoration Bread. 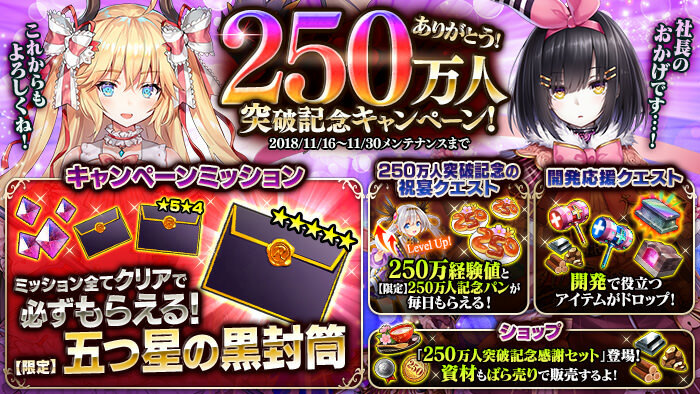 Collect the [Limited] 2.5m Commemoration Bread from the [2.5m User Commemoration Banquet] to complete the [Campaign Missions] to get wonderful items! ※ After collecting a Collect 1x [Limited] 2.5m Commemoration Bread, it will be counted on the mission list and can be used. ※ There will be additional methods of collecting [Limited] 2.5m Commemoration Bread at the next update in the campaign. ▼ [Manufacturing Support Quest] appears! During this period, the [Manufacturing Support Quest] appears. This quest drops items useful for manufacturing such as resources, [Limited] Resource Set, [Limited] Rainbow Anvil and other items. A large coin commemorating over 2.5m presidents across the country. Can be sold for 2.5m Gold. During the campaign, the shop will have the following items for sale. In addition to this, the Google Play version is celebrating its 1 year anniversary. Log in every day to receive a [Limited] Black Fairy Envelope, from now until the 11/30 (Fri) maintenance. This item will expire at 00:00 the next day if left in your mail box and must be claimed within the 24 hour day. Last edited by Folseus; 11-20-2018 at 05:00 AM. >Log in every day to receive a [Daily] Black Fairy Envelope, from now until the 11/30 (Fri) maintenance. A filler campaign huh? Good time to use some of these exp mission tickets. I highly recommend using a gold ticket along with all these 2500 bread items. Last edited by Fiir-chan; 11-23-2018 at 03:33 PM.